Welcome to the second annual Eclipse Foundation Community Report. Comments and feedback on the style and content would be appreciated at emo@eclipse.org. Other than the financial information, this report will cover the period April 1, 2012 to March 31, 2013. The Eclipse technology is a vendor-neutral, open development platform supplying frameworks and exemplary, extensible tools (the "Eclipse Platform"). Eclipse Platform tools are exemplary in that they verify the utility of the Eclipse frameworks, illustrate the appropriate use of those frameworks, and support the development and maintenance of the Eclipse Platform itself; Eclipse Platform tools are extensible in that their functionality is accessible via documented programmatic interfaces. The purpose of Eclipse Foundation Inc., (the "Eclipse Foundation"), is to advance the creation, evolution, promotion, and support of the Eclipse Platform and to cultivate both an open source community and an ecosystem of complementary products, capabilities, and services. This makes the Eclipse community a unique open source community. Not only are we interested in building open source code, we are equally committed to creating a commercially successful ecosystem around that code. This combination of interests has been a key part of Eclipse's success. The following are the strategic goals of the Eclipse Foundation for 2013, as set by the Board of Directors. Be the developer platform of choice. The goal of Eclipse is to define a development platform that is freely licensed, open source and provides support for the full breadth of the application lifecycle, in many disparate problem domains, and across the development and deployment platforms of choice, including both desktop and the web. At least since 2004, Eclipse projects have been shipping innovative runtime technologies such as Equinox and the Rich Client Platform. 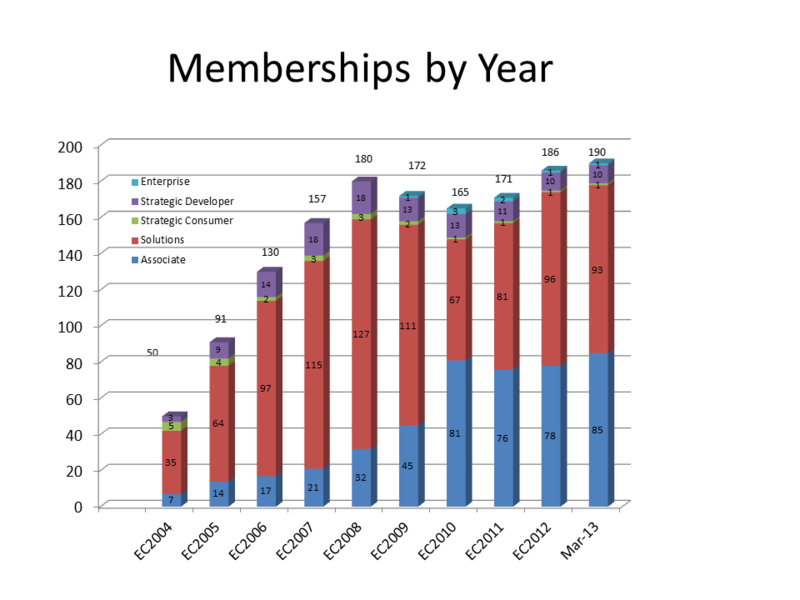 The last several years have seen steady growth in runtime technologies at Eclipse. At the same time, there has been rapid growth in interest in OSGi, which is the standard upon which the Eclipse plug-in model is based. Moving forward, we expect to see rapid growth in both the projects building and the adoption of Eclipse runtime technologies. Advance Eclipse technology on high-growth platforms such as web, cloud and mobile. This is not just about the IDE for which Eclipse is famous. Rather, this goal is about growing the portfolio of technologies being built within the Eclipse community. Examples of new projects which are helping to address these goals include Orion, and our machine-to-machine projects. Create value for all its membership classes. The Eclipse Foundation serves many members whose primary interest is leveraging Eclipse technologies in commercial offerings such as products and services. The Eclipse Foundation will focus its energies to ensure that commercial opportunity exists within the Eclipse ecosystem. Look for continuous improvements to Eclipse Marketplace, and for other initiatives that benefit members. Committers are also members of the Eclipse Foundation and are in many ways its backbone. The Eclipse Foundation and its staff will continue to look for opportunities to improve services to its project community throughout the year. Look for enhancements to our web, download, code management, build and other key components of project infrastructure in 2013. Foster growth of the ecosystem, particularly in verticals. The creation of a large community of commercial and open source organizations that rely on and/or complement Eclipse technology has been a major factor in the success of Eclipse. Each time Eclipse technology is used in the development of a product, service or application the Eclipse community is strengthened. Our goal in 2013 is to continue to focus our attention on the creation of working groups and new Eclipse projects that focus on particular industry segments such as aerospace, automotive, and finance. Continue to grow a diversified revenue model. Reliance on a single source of revenue to fund the Foundation puts us at greater risk of being negatively impacted by industry specific business cycles. It is a goal of the Eclipse Foundation to ensure revenue sources from multiple types of organizations, and seek other sources such as events and sponsorships. Signing the Oracle TCK Agreement: After a long process, the Eclipse Foundation signed the Java TCK agreement, allowing Eclipse projects who require access to TCKs the ability to acquire them. The process of doing so is going to be tightly controlled, as the TCK licenses do place a number of encumberances on opens source projects. The Board has approved the use of the TCK by the Project by a super-majority vote of the Board. To date, the EclipseLink and Virgo projects have been approved by the Board to request TCKs. Implementing Contributor License Agreements: Historically, the Eclipse Foundation's projects have not relied on Contributor License Agreements (CLAs) to ensure that we acquired all of the rights necessary to accept a contribution. Instead, the project committers would ask each contributor three questions regarding the provenance of their contributions. However, as the Eclipse community moved to git, and adopted code review tools such as Gerrit, it became increasingly clear that this process was impeding contributions. Accordingly, in 2013 the Eclipse Foundation will be implementing CLAs for it's contributors. At the same time, the Eclipse Foundation will be implementing the use of signed-off-by for contributions made via git, and has published a Certificate of Originality which documents what the use of signed-off-by means for contributors. Reviewing the Eclipse Public License: The Eclipse Public License was drafted some 15 years ago. The Board has decided that it will ask the Eclipse and open source communities for feedback on how the license could be improved and updated. A transparent and community-led discussion will commence in 2013. The Eclipse Foundation's fiscal year end is December 31. Our auditors are the firm Deloitte & Touche, LLP. The Eclipse Foundation is incorporated in the State of Delaware, USA as a 501(c)6 not-for-profit. Its headquarters is located in Ottawa, Canada. 2012 was another solid year financially for the Eclipse Foundation. Google raised their membership level to Strategic Developer, website advertising continues to be strong, and working group revenue continues to grow. Despite originally budgeting a $0.3M loss, the Eclipse Foundation lost only $0.1M, and was able to contribute to its cash reserves. The organization continues to be on a solid financial footing. A summary of the past three years of audited financial results are contained in the table below. 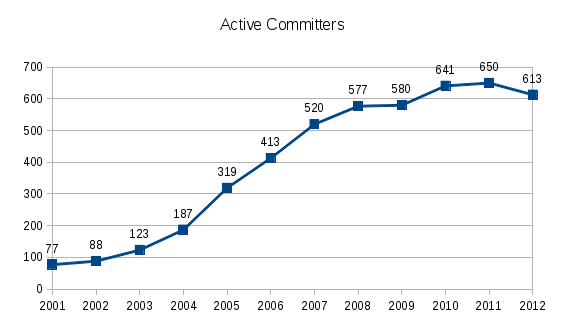 The Foundation finished 2012 with a total of 186 members. By the end of March 2013, that number had increased to 190. Some of the companies who joined in the past year include: Architexa, Checkmarx, Combitech, Coverity, DevBoost, Eucalyptus Systems, HP, Intecs, Itpearls, Lucierna SL, OpenGeo, and WireframeSketcher. Enable organisations to collaborate when providing support and maintenance for Eclipse technologies. Enable support and maintenance of Eclipse technologies for Long Term (years) and Very Long Term (decades) durations. Fundamentally, LTS is intended to save time and resources for companies who have built Eclipse-based products, and require the infrastructure to support and maintain those products. Historically, building and fixing older Eclipse releases has been a difficult task. Worse, each company with this need was required to develop the necessary skills and processes necessary on their own. The goal of the LTS working group is to provide a single, shared service to make it easier to support and maintain older releases of Eclipse technologies that are embedded in commercial products. As the Eclipse community has grown, it has become clear that there is a lot of demand for the Eclipse "style" of open source development, where there is a significant focus on enabling a commercial ecosystem as well as developing code. This has given rise to the Eclipse Working Groups, which are separate, identifiable communities of interest with their own consortium and projects. In some cases, working groups maintain their own separate forge, website, and brand. However, all working groups operate under the the auspices of the Eclipse Development Process and Intellectual Property Policy of the Eclipse Foundation. Automotive: Innovation in the automotive industry is mostly achieved by electronics and software functions. The system automobile is becoming increasingly complex, an open developer tool workbench that extends throughout the supply-chain is becoming a must for the industry. Improvements and innovations to these software development tools are required to accelerate product development, create high quality software features and improve integration across the automotive supply chain. In the past year, the Eclipse Automotive Working Group has been defining and releasing its own package for Automotive Software Developers. This release provides a stable platform for tool providers in the domain to build on. Other projects of the group target build enironments, tools certification processes and extensions for various other tools. The group has currently 9 members, including BMW Group, Continental AG adn Robert Bosch GmbH. The LocationTech working group launched February 5th, 2013 and continues to grow and demonstrate increasing momentum. Founding Strategic members include IBM, Oracle, Actuate, and OpenGeo. Participating members include OSGeo and Carleton University's Geomatics and Cartographic Research Centre. There were 4 projects and proposals in place for launch. Machine-to-Machine (M2M): The Eclipse M2M Working Group has made significant progress in developing a platform of frameworks, protocols and tools for building M2M applications. There are now 3 active Eclipse open source projects that target the M2M industry: 1) Koneki provides Lua development tools, 2) Paho provides open source reference implementation of the MQTT client and 3) Mihini provides frameworks for device management. Eclipse is also participating in the OASIS Technical Committee to standardized the MQTT protocol. The active members of the M2M WG are Sierra Wireless, IBM, Eutrotech and Axeda. Polarsys: The goal of Polarsys is to build and maintain an open source tools chain that is used by organizations building safety-critical and software intensive embedded systems. Industries such as aerospace, defense, transportation, telecommunications, energy and healthcare require development tool chains with a number of specific requirements, including very long term support and maintenance requirements. In the year after its creation Polarsys has issued its first roadmap and is currently working on the first release of the Polarsys IDE which is due in October 2013. Aside from that, other projects have been started by the POlarsys members. The current member list consists of Airbus, CEA List, Ericsson, Thales, Atos, Intecs, Obeo, Combitech and SoyaTec. No description of the Eclipse Foundation's activities can fail to mention our community's successful conferences. EclipseCon and EclipseCon Europe were both enormously successful. Both events were beyond our expectations with regard to participants, sponsors, and positive attendee feedback. As but one sample metric, the EclipseCon Europe 2012 attendees gave the conference an overall rating of 1.77 (1 = “Excellent, 2 = “Very Good”), the highest rating of any conference we've ever run. New in 2013 will be our first EclipseCon France. The EclipseCon conferences, Eclipse Days and DemoCamps are the primary events that the Eclipse Foundation supports to help foster the strong personal relationships in the community that only face-to-face contact can create. We highly encourage all Eclipse community participants to participate in these events. During the time period spanning April 1, 2012 to March 31, 2013, the Eclipse Foundation received 920 requests for code review and completed review of 740 requests. Resource constraints in the Intellectual Property (IP) arena were alleviated this past year with the hiring of Pablo Jacubovich who joined the IP Group as an Intellectual Property Analyst. The addition of Pablo to the IP Group, together with a lower volume of requests for code review for the Kepler simultaneous release (27) as compared to Juno the previous year (136) enabled the IP Group to reduce the backlog of code review requests to an all time low. As of the time of this writing, the backlog of requests for code review stands at 70. With increased activity in the Working Group arena and larger pre-existing open source projects moving to Eclipse, it is expected that we will see a rise in the backlog of requests for code review in the coming year and modest increases in turnaround time for requests for code review. Due to the modest growth anticipated, no further hiring is expected in the IP Group in 2013. The past year has seen an enormous amount of innovation within the Eclipse community. A few key projects and technology areas are listed below, with comments on both their recent past, and their future direction. This is certainly not intended to be exhaustive, but will hopefully provide some of the highlights of the exciting technologies being built by the Eclipse community. In June, 2012 the Eclipse community shipped Juno, its seventh annual simultaneous release. Including previous releases of the Eclipse Platform, this was the ninth release that was shipped on time to the day. 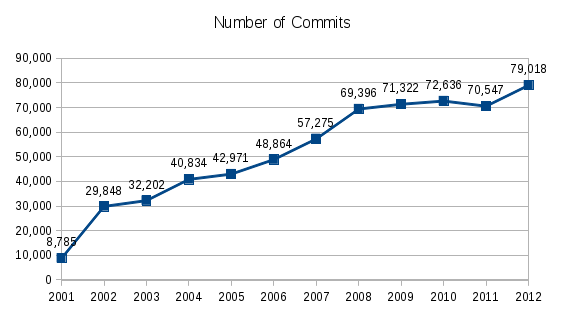 Seventy-one projects participated in the Juno simultaneous release, comprising 60 million lines of code. This predictable release process has been a key part of Eclipse's success over the years, and is an important part of the success of the Eclipse ecosystem. With the release of Kepler in 2013, the Eclipse 3.x stream will no longer be supported. The new Koneki project provides world-class Lua development tools for M2M application development. It should be noted that significant performance issues were reported after the release of Eclipse Juno. Most of these were related to particular combinations of plug-ins and usage which were difficult to test for. The Eclipse platform team responded quickly and the February 2013 4.2.2. service release addressed most of the known issues. Vert.x: The Vert.x project decided to move to the Eclipse Foundation in February 2013. Vert.x is a very interesting new JVM-based polyglot runtime project. Although vert.x will be joining the EclipseRT community, the project will not be making use of OSGi. Eclipse Bundle Recipes: The EBR project will provide "recipes" in the form of template files which can be used to convert open source library Jar files into OSGi Bundles. EBR will be a subproject of the EclipseRT and will leverage the functionality of existing projects. uDig: uDig is our first LocationTech project and is an open source desktop application framework, built with Eclipse Rich Client (RCP) technology. uDig provides a complete Java solution for desktop GIS data access, editing, and viewing. Sirius: Sirius aims at providing specific multi-view workbenches through graphical, table or tree modeling editors. Users can easily define their own modeling workbench, even with very little technical knowledge of Eclipse, while still being able to deeply customize it when needed. Mihini: The Mihini project provides an open source implementation of an embedded runtime exposing high-level Lua API that can be used to develop portable M2M applications easily. It is one of our first Lua language projects hosted at Eclipse, and is closely related to the Koneki project, which provides an Eclipse-based Lua IDE. The EMO is committed to providing steadily improving services to the Eclipse Committers and the projects they work on. Here is a sampling of some infrastructure metrics, plus some improvements we've put into place over the past year. The Eclipse community has migrated from CVS to Git as their source code management tool. CVS was shutdown on December 21, 2012, and SVN has been deprecated. Today, git.eclipse.org has over 500 repositories. Overall service availability was 99.94% for our three mission-critical services: Bugzilla, Git and our website, www.eclipse.org. Bugzilla and Git reached four-nines availability (99.99%) whereas a DDoS attack on our Forums reduced availability of our website to 99.83%. Our entire server infrastructure was moved to a new data center, providing us additional cabinet space, improved cooling, a 42% bandwidth increase and more AC power, at a lower cost to the Foundation. New servers were deployed: virtual hosts for additional CBI capacity (build and test), a new database server was added to the pool and a new 2 TB storage unit for build-related tasks replaced an 8.5 year old unit. As of September 2012, we've been relying on an in-house backup and restore system based on open source software. This solution, in addition to being more economical than our previous system, has proven itself to be dependable and very flexible. The Common Build Infrastructure (CBI) is a service offered by the Eclipse Foundation to its projects. It is primarily a collection of technologies and services which enable Eclipse projects to build their code on Eclipse Foundation servers. The technology stack includes Maven, Tycho, Hudson and Nexus. Core services include a Jar signing facility, MacOS signing facility, and Windows signing facility. CBI has been deployed for a number of projects. For example, the projects using CBI are contained in 60+ git repositories. Notable in the list is the Eclipse Platform. The feedback for CBI has been extremely positive. People are impressed that for the first time, they can build the Eclipse Platform in minutes with very little effort. The goals of CBI are primarily around further reducing barriers to contribution to Eclipse projects. By making it easier to build and test Eclipse code, we hope to encourage more developers to contribute to Eclipse projects. Efforts continue to roll out CBI as widely as possible to Eclipse projects. 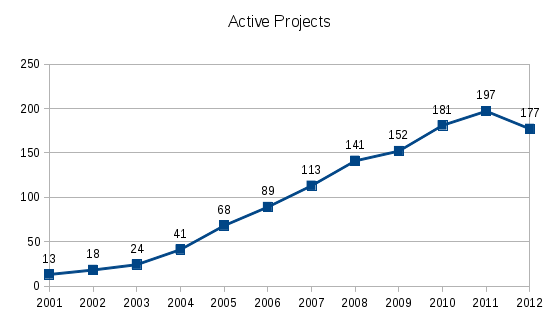 In late 2012, the Eclipse Foundation completed the initial release of a new effort to replace the existing project management infrastructure – which includes the Developer Portal – with a new unified infrastructure with the intent of making project management activities more consistent and generally easier for all involved. The initial release was rolled out for Eclipse Projects and LocationTech in early 2013. Improved consistency: We implemented configuration/data-driven project web presence, and direct linkage among releases, reviews, and plans. Information – including basic project metadata, project plans, and release review information – is captured and retained in a consistent (and easily leveraged) data- based format (rather than in multiple documents in arbitrary formats). All-in-one-place: Committers are able to edit information in place on the project information pages. Text/information in one place with links in another is eliminated wherever possible. Comments and discussion related to reviews, elections, etc. are connected directly to the item being discussed. Get started faster: By default, projects are provided with a data-driven website that includes consistent links to project releases, reviews, downloads, etc. Projects can opt to override the default and provide their own customized web presence.Setting up a project presence is a matter of configuration, not PHP programming against proprietary APIs.